Pollock made his international bow at the Junior World Championship in Japan in 2009 and quickly rose to prominence, making the reserve list for the Rugby World Cup two years later. He had made his Tri-Nations bow earlier in the year - taking charge of Australia v South Africa - and followed it up with a spot on the Six Nations panel. 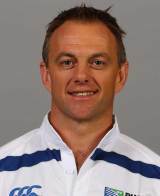 After refereeing Scotland's loss to Ireland in Dublin he retained his place among the game's elite officials with a place on the IRB selection for the 2012 June Tests.